The Liberty Pump CSP-457 is a crawl space, sump pump kit that features a 1/2HP automatic, sump pump and a poly sump kit with poly cover and hose kit. This crawl space, sump pump kit is ideal for dewatering under homes, basements, crawl space areas and other areas where water may accumulate. The Liberty CSP-457 can handle solids up 3/8" and has a discharge of 1-1/2" NPT. This 1/2HP crawl space, sump pump kit is designed to control problems with mold, fungus, moisture and structural damage. The Liberty CSP-457 features a heavy-duty submersible sump pump with a 1/2HP motor. It also comes with a 16.5"x15" perforated polyethylene sump pit with a cover and a 24'x1-1/4" flexible hose kit. Assembly is required for this crawl space sump pump kit. 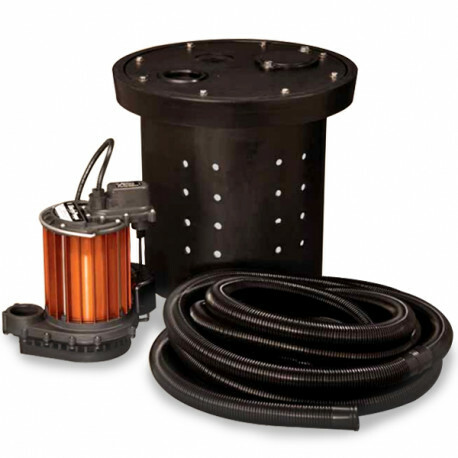 This sump pump kit can help reduce problems with rodents, insects and pests that are attracted to wet environments.